Unlock the old secrets of the White family by unveiling William’s disappearance. Go on an adventure with Lisa and help her to find her father in a place where anything can happen... After many years of relentless research, William goes on an expedition with his brother James in search of a secret island. 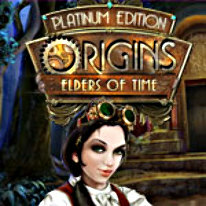 It has now been more than 20 years since James is back alone from this journey we know nothing about... Find all kinds of items that you may need for your quest and solve numerous puzzles on your way in order to succeed in Origins: Elders of Time Platinum Edition. -EXTRAS: Complete walk-through of the game, wallpapers, game music and even more!